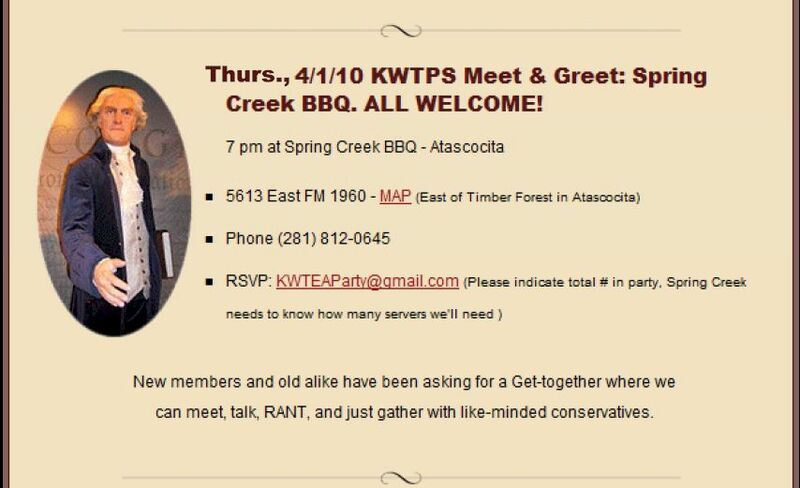 Meet & Greet | Kingwood TEA Party, Inc.
Monday 11/15 TX Sen. Dan Patrick visits KWTP — Join Us! Kingwood TEA Party Goes BACK TO MONDAYS at LOS CUCOS!!! The celebration continues as we prepare for the Lame Duck Congress & our Texas session with TX Senator Dan Patrick! TX Sen. Dan Patrick will be here to discuss the Texas TEA Party Caucus and implementing our conservative agenda in Austin in 2011. What is the Senate Blocker – Rose Bush Rule (Begins at 2:35 into the video) and why does Sen. Patrick think it needs to end? Join us and find out! will join us tonight explaining how they are fighting to help us make the changes our country so desperately needs. Kindly RSVP: KWTEAParty@gmail.com Subject line: 10/6 – (and number attending). Cherrie Ledoux and A Grand Affair will provide concessions and drinks for us again.